Trying to get up to speed on our new city is taking time, but it is time well spent. If we have house guests, we want to have fun places and interesting sites to show them. 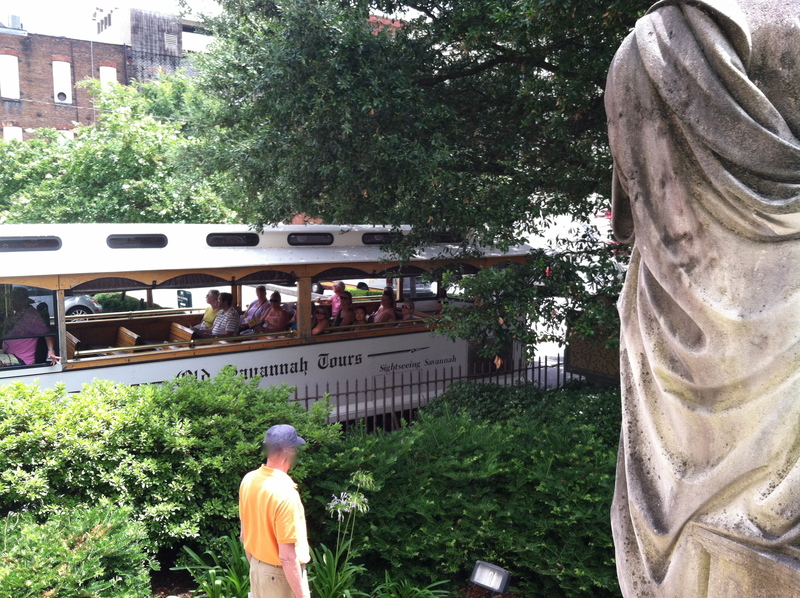 One way to get a well-rounded view of Savannah is to take one of the trolley tours. You will hopefully get a beautiful day and a well versed guide! Savannah is an intimate city and very easy to see on foot, but on your first day, you might want to get a general overall impression from the comfort and charm of a trolley bus, and then take it from there, exploring on foot. 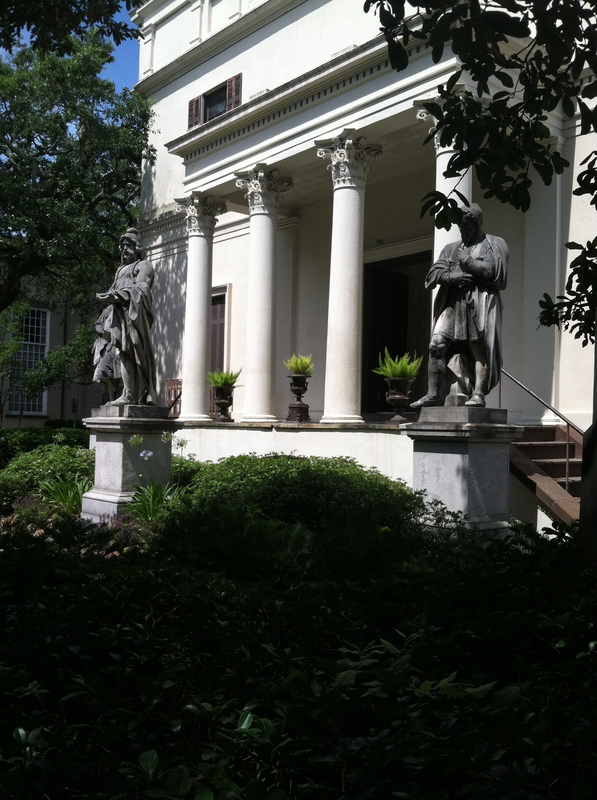 Today dear husband and I set out to visit the Telfair Museum. I hope to share more with you in future blogs – all in good time. Because as you know, I’ve now got a small place to plant and weed! It takes time – more time well spent! My little plot now has a few tomato plants and a pepper and some herbs. I planted sunflowers on Monday evening, and they were germinated by tonight! 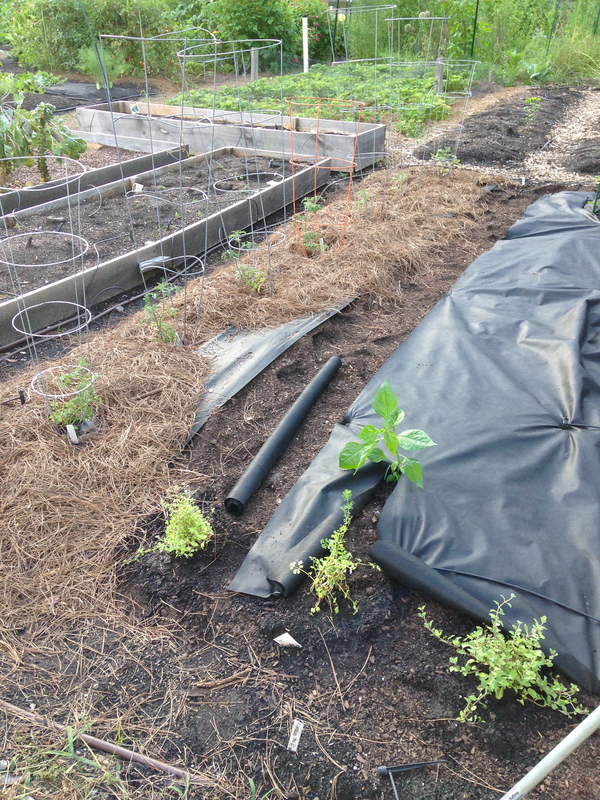 I’ve used landscape cloth to keep the weeds down, and covered with the mulch used predominantly here – pine needles. Wish me luck, as it is starting to get HOT here in Georgia. Oh, another reason to visit Georgia in June? The farm stands that pop up are AMAZING! Juicy peaches, rich, ripe tomatoes, sweet corn and boiled peanuts!! 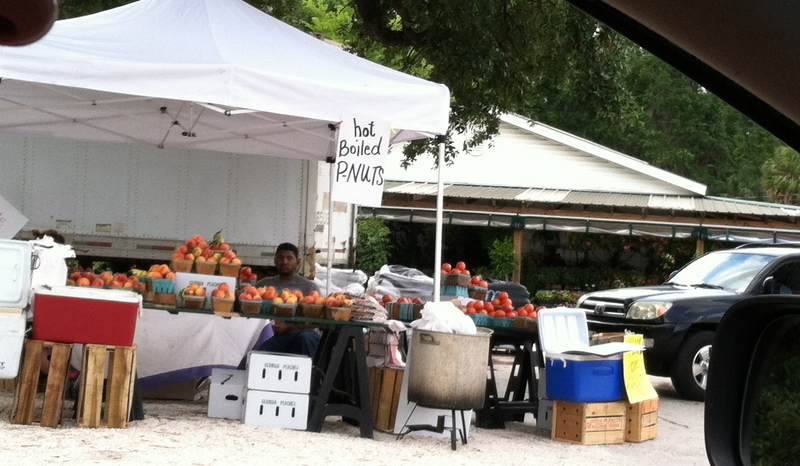 This entry was posted in Uncategorized and tagged farm stands, Georgia peaches, pine needle mulch, Savannah sight see, Savannah trolley, Telfair Academy. Bookmark the permalink. Moving to a new area is always so exciting! So much to do and see that is new, you will be having a wonderful time this summer. I am amazed that you have done so much on your allotment so soon, you have been busy! Hot boiled Peanuts? What on earth is that! The garden looks like it’s moving along. Don’t get too hot out there! ….I keep noticing the variegated canna in the background and love it. 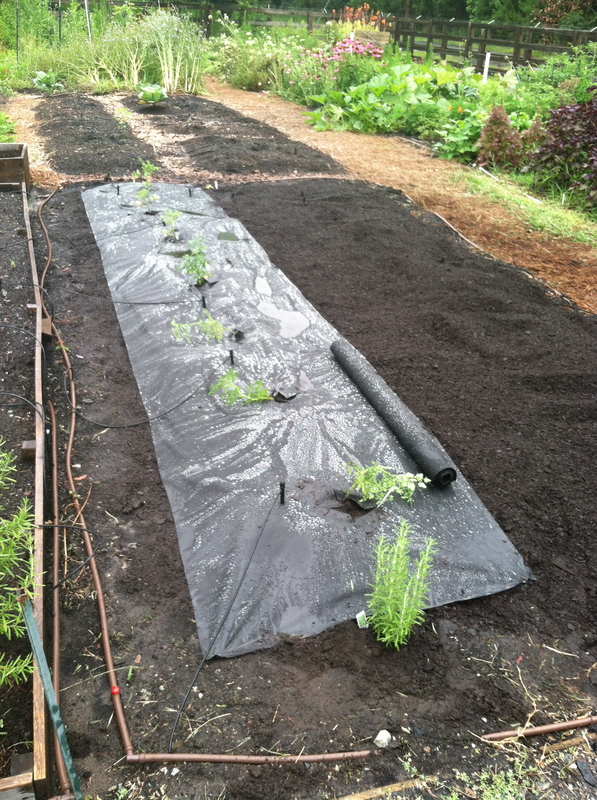 Your vegetable garden is looking good! Sounds like all the plants are on steroids down there. We never did make it to Telfair when we were in Savannah but that’s a good reason to go back. Hi Jayne, it sounds like such an idyllic, easy going place. It’s good that you’re getting out and finding out about you local area. We moved months ago and we’ve so busy that there’s been very little time to just explore and find those hidden treasures. No doubt they will be discovered in time, but I’m far too busy with the house and garden at the moment. Well done on getting started so quickly in your new plot, I’ve also planted a load of sunflowers in a new bed at the front, just to have something in flower. Hello Jayne, thanks for stopping by my blog and leaving a comment, Savannah looks elegant and very interesting. I shall follow your garden progress with interest. 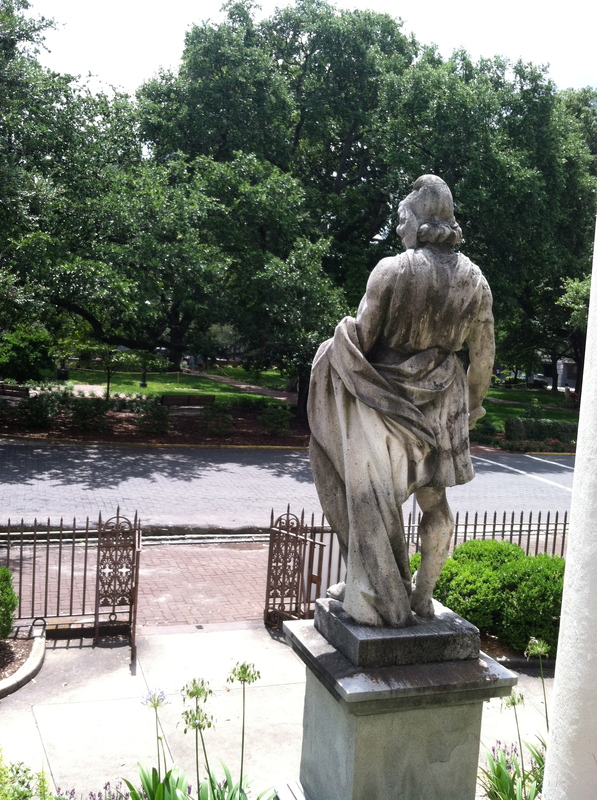 A tour is a great way to start to learn about Savannah. I get distracted by all the shops when we do tours on foot! Good luck with your gardening, and do listen to bittster and watch the heat. It can get dangerous with high humidity. I read through all your Savannah posts. The restaurant looked wonderful! I will have to try that one out the next time we are there.